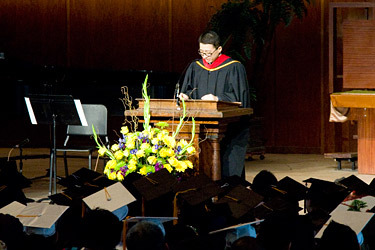 On February 11, Jimmy Ha, a beloved religion professor who has been battling cancer, spoke for Pacific Union College's annual senior recognition program. The officers of the class of 2010 invited Ha to speak at this program, and the school body welcomed him with a standing ovation. Ha, who is also a PUC alumnus, explored "what unites us as a community of faith and learning — besides Facebook." He suggested that key elements are that we all long for meaning, we believe in the idea of truth, we believe in the notion of good and evil, we are interdependent, and we share the Christian faith. But, he said, "ultimately what unites us is death." Acknowledging the apparent morbidity of that statement, he elaborated: "When a Roman general would return from war parading in triumph into Rome to the adulation of the admiring crowd, a slave would behind him whisper into his ear, 'Memento mori.' Remember you shall die." So, in this moment of recognizing students' accomplishments and looking to a bright future, Ha said, "I whisper humbly behind you, 'Memento mori. '… It is a call to humility that makes all these commonalities I mentioned even possible." He recounted how as a young intern he would spend lunch breaks in a nearby cemetery. The words most commonly chiseled on these tombstones were "devoted," "beloved," and "loving." Ha noted that he never saw such words as "multitasking, attractive, successful, wealthy, fashionable, technologically proficient…"
"That's perhaps what unites us as we think about life and death," Ha explained. "The desire, the need, and the capacity to love and to be loved. I wish this for you, I pray this for you — to love and to be loved." During the program, the Jimmy Ha Endowed Scholarship was also announced, a scholarship established by the Ha family to honor professor Ha's devotion and love for PUC and higher education. Academic Dean Nancy Lecourt also presented the Class of 2010, consisting of 270 soon-to-be grads with highest numbers from the business and nursing programs.